For Proust it was a madeleine. For the narrator of Spies it was the cloying, heady smell of a flower in a suburban garden, and it took him back to a wartime summer, a hideout in the garden hedge, secrets, fantasies and ambivalent shame. Stephen Wheatley was small and unpopular, with ears that stuck out. His friend Keith was unpopular too, but he lived in a big house, his toys were kept in pristine condition in their boxes, and the afternoon teas dispensed by Keith’s mother were Blytonesque, even if she did so without ever quite acknowledging Stephen’s presence. Stephen was drawn along in Keith’s wake and when Keith announced that his mother was a German spy, well, then- yes, perhaps she was. After all, there was her diary with the odd crosses once a month in keeping with the phases of the moon (for night-time spying duties, of course), and she seemed to spend a lot of time going into the village posting letters (to the German authorities, of course) or pretending to shop for her sister who lived down the street. So the boys snooped in her writing desk and followed her, and found more than they had bargained for. This is a beautifully told story. 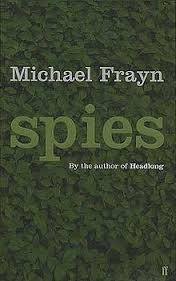 It has that wistful, golden glow of L.P. Hartley’s The Go-Between or Ian McEwan’s Atonement, and as in those books, the narrator in Spies also sees too much and yet doesn’t know what s/he is looking at. Frayn’s control of the story is masterful, especially in the switch between present tense and reminiscence, which can be clunky in less sure hands. This was the second time that I had read the book, but I think even the first time I quickly cottoned on to Stephen’s misconstructions – just as Frayn, I think, intended his readers to do. The story is told with humour and humility, and the adult Stephen is affectionately kind to his younger self and withholds judgment from him. Little details fit together so cleverly- the play on ‘privet’ for example- and the last chapter colours in much of what had only been sketchy or incomplete previously. I really liked this book, just as much on the second reading as on the first. You’re in the hands of a master writer, and you know it. What a wonderful night. 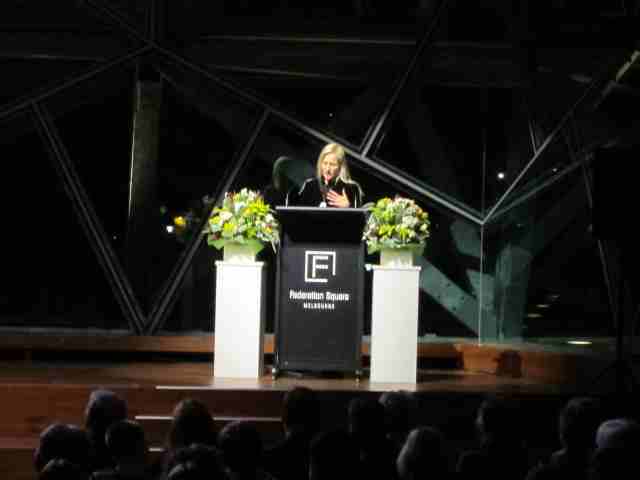 This Anzac-eve function was organized at the Deakin Edge theatre at Fed Square by the Medical Association for the Prevention of War, with support from the ANZAC Centenary Peace Coalition and funding from the Dept of Veteran Affairs ANZAC Centenary Local Grants Program. 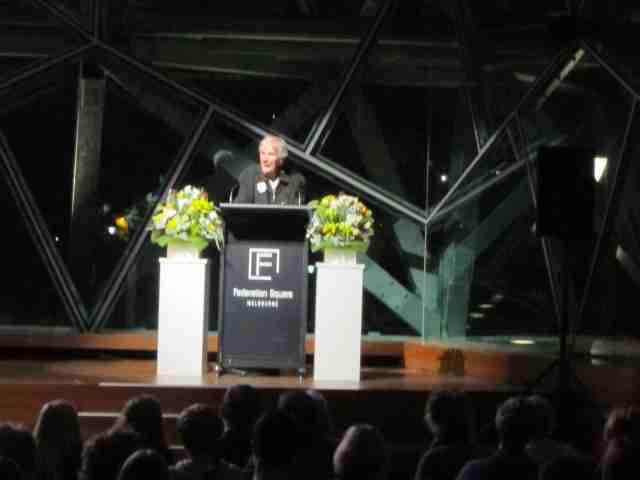 The night started with a presentation by Jackie Mansourian from PEN Melbourne who spoke about the Armenian Genocide- that other centenary that marks the arrest of 250 Armenian intellectuals on 24 April- and the resistance of the Turkish government to have it acknowledged as the century’s first genocide. She spoke of the assassination of Hrant Dink, the editor of the Armenian-Turkish newspaper Agos by anultra-nationalist in 2007 after Dink referred to the 1915 massacre of Armenians as ‘genocide’. At the time Dink was being prosecuted under Article 301 of the Turkish Penal Code for ‘denigrating Turkishness’. Then Kellie Merritt, the widow of Flight Lieutenant Paul Pardoel who was killed in Iraq in 2005. She said that she was apprehensive about public speaking but she was fantastic: controlled, articulate, forceful. She spoke of her resentment at the conflation of personal grief with political argument. Honouring personal grief did not necessarily mean honouring the political purpose and intention for deployment. The two aims of the Iraq War of 2003 were never met: there were no Weapons of Mass Destruction, and one dictator was merely replaced with another dictator of a different sectarian hue. She particularly resented Attorney-General George Brandis who attacked those who drew links between the 2003 and 2015 deployments as “simple-minded” and “ignorant”. 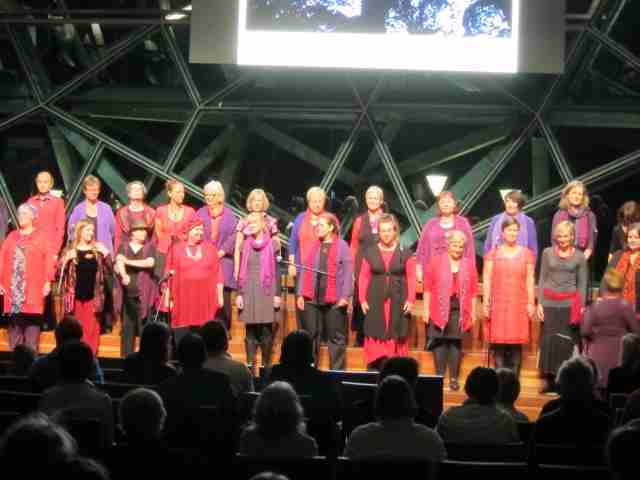 She was followed, after long and heartfelt applause, by the Melbourne Singers of Gospel, a huge choir – I counted at least 55 people -who gave a terrific rendition of ‘When the War is Over’ . 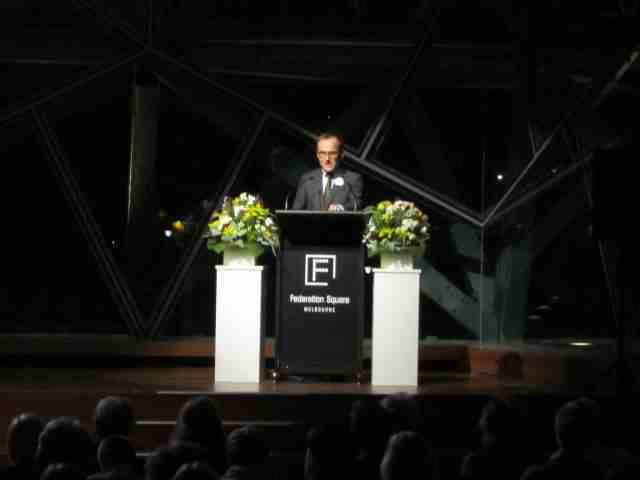 Adam Bandt, the Greens member for Melbourne spoke next after taking a picture on his phone of the assembled audience. He picked up on Kellie Merritt’s call for Parliament to be required to approve the deployment of Australian troops (unless we are facing imminent threat). Even though Parliament may still approve it- and with our current government and opposition, that would be the case- it is still important that the reasons for sending troops overseas be articulated and that Parliament be accountable for the decision. Peter Cundall, the 88 year old peace activist and gardener spoke next, speaking about his experience in both WWII and the Korean War. You can find the rest of the poem here. It’s powerful writing. 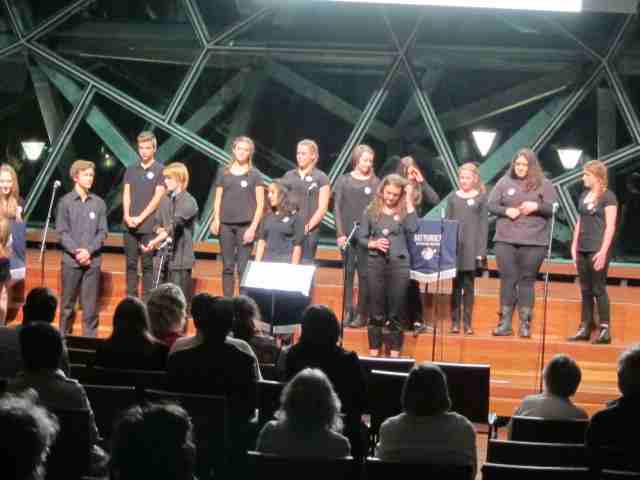 It was affirming to finish with a group from Brunswick Secondary College, singing a beautiful arrangement of Dolly Parton’s ‘Light of a Clear Blue Morning’ and John Lennon’s ‘Imagine’, prefaced by the worlds spoken in many different languages. 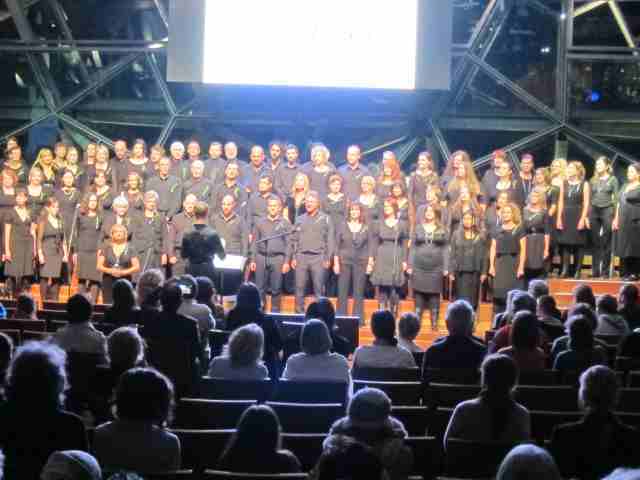 I was proud that this is a government-school based choir of engaged young people. …participate in a once in a lifetime event [which] will take your emotions on a roller coast as its [sic] blends moving tributes with commemoration. You will learn, sing, eat, drink, laugh, (and cry) but most importantly you will be together. 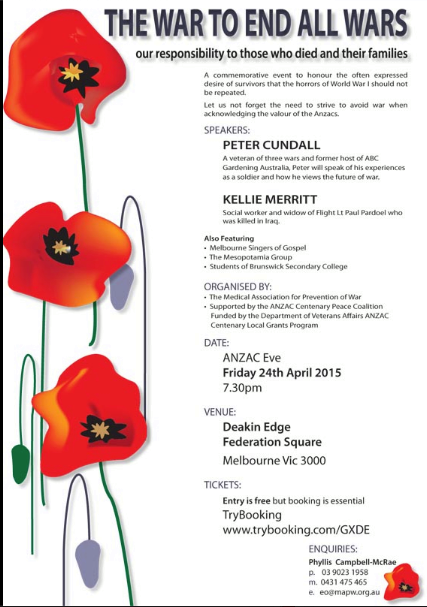 …a special night of remembrance, entertainment, mateship and the birth of the ANZAC spirit… There will be entertainment, special guests, movies, documentaries, great food options and a very Special Dawn Service on ANZAC day itself. And it would appear that all those ANZAC blockbusters planned for television have garnered only lukewarm ratings as well, although I’ve read good things about Sam Neill’s documentary so I may watch that. Claire Wright, who was involved in the documentary ‘The War that Changed Us’ some months ago suggests that Gallipoli fatigue at all the “ANZACkery” seems to have set in ahead of time. Maxine Beneba Clarke is described in the afterword as a “spoken word performer” and the author of several poetry collections. You can tell. There’s a real joy in the sound of voices in this book, and it comes through loud and clear. Voices plural because there’s multiple narrative voices here from all over the world: a Sudanese woman in Footscray in ‘David’ ; a Jamaican school girl in suburban Australia herself fighting for acceptance being asked to “look after” a new Vietnamese student in ‘Shu Yi’ ; Delores in New Orleans in ‘Gaps in the Hickory’ and, most challengingly, Nathaniel speaking in Jamaican patois in ‘Big Islan’ as he gropes towards literacy and awareness of a larger world. I sometimes find when I come to the end of a book of short stories that I can’t quite remember what happened in which book. That’s not the case here. She uses imagery so well in ‘ The Stilt Fishermen of Kathauluwa’ that the story is unforgettable, and it is one of the most powerful stories about so-called ‘illegals’ that I’ve read. The young girl hanging upside down from the monkey bars, paralysed with fear in ‘The Sukiyaki Book Club’ is a memorable image for the writer herself, writing on despite one rejection letter after another. 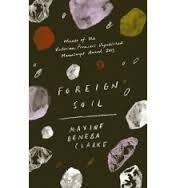 The cold fear in ‘Foreign Soil’ as an Australian woman realizes her mistake in following the man she loved to Uganda is almost palpable. I just loved ‘Gaps in the Hickory’ even though I guessed the ending- and what a satisfying ending it is! There’s not a single story here that falls flat. They’re all well-crafted, opening up possibilities and yet leaving you in no doubt as a reader that you’ve reached the end. Her observations are sharp and her ear for language acute. Blurbs often trumpet things like “the arrival of a major new voice” and the blurbs on this book are no exception. I think, this time, they’re right. 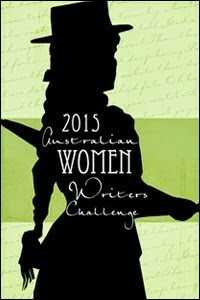 Posted on the Australian Women Writers Challenge. And so far, my pick for the 2015 Stella Prize. I’ve noticed this book bobbing around on long-lists for the various literary prizes on offer, and it has been shortlisted for the Stella Prize. The young author is of mixed indigenous and Dutch heritage, and she seems to have taken to heart the aphorism “write what you know” because the stories are written about or from the perspective of a young indigenous person. The book is divided into three parts: Heat, Water and Light. The first part, Heat, comprises a number of short stories about the Kresinger family which interweaves magic realism and contemporary indigenous family life. The stories are tangentially connected, a technique I enjoy, giving them stand-alone status within something larger. The second section, Water, contained only one story and it was probably my favourite one. Kaden is a young Aboriginal woman employed in a scientific program engaged with research on ‘sandplants’, a marine lifeform that has been found to have almost human intelligence. The sandplants are found around islands off the Queensland coast that are about to be reclaimed for a new Aboriginal nation (Australia2) under a bold new plan by President Tania Sparkles. The plan which at first sounds seductive becomes increasingly sinister in this story set in the near future, and as Kaden becomes closer to Larapinta, one of the sandplants, their relationship changes. The blurb on the back of the book tells me that in the final section ‘Light’ “familial ties are challenged and characters are caught between a desire for freedom and a sense of belonging”. Yes, but I must confess to finding this last section bitsy and insubstantial. Having only just finished it, I can only remember two stories well- my memory of one probably reinforced by the picture on the front cover, and the final story which was very good. For many of the others, I only knew that it had finished because there was a blank at the bottom of the page, and I found myself wondering about the point of it. The stories seemed like fragments. So, all in all- a bit of a curate’s egg of a book: good in places. The writing is lyrical, but occasionally somewhat overwrought. It’s a good debut collection but I’m not convinced that it’s prize-winning material, though. I’ve posted this review to the Australian Women Writers Challenge site. Well, well, well- look at what’s back on the market. The advertisement with more beautiful pictures is here. 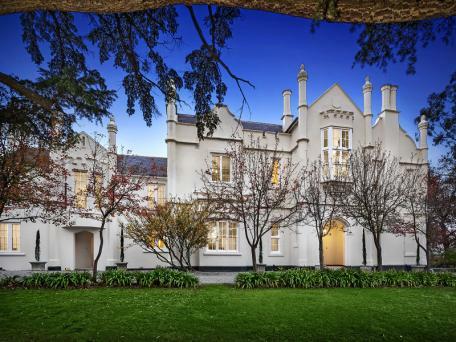 The auction is scheduled for 16 May 2015. What Cooda that song have been? We were sitting in the car on the way to the supermarket on Saturday morning, listening to the Coodabeens on the radio. The Coodabeen Champions is a comedy sports show which features Greg Champion’s parodies of popular songs, with the reworked lyrics often submitted by listeners. So there we were, humming away and laughing to a song from the 1970s, and when we turned to each other and asked “What was the name of the original song?” neither of us could remember. I hummed it, he whistled it (because I can’t whistle) but the chorus just wouldn’t spring to mind. I had a feeling that it was an Australian group (I had Black Sorrows lurking around there somewhere), although it sounded a bit like Jethro Tull’s ‘Thick as a Brick’. Ah Google- what did we do before you? I downloaded a podcast of the second hour of the show, having deduced that we were listening at about 11.30 am. When I listened to it again, all I could remember was the line “the season goes so quickly” (which also featured in the parody) and that was enough for Dr. Google – the answer is: Seasons of Change by Blackfeather. On this album was a song that was to become not only a hit for two different bands, but also proved to be the catalyst for another major problem within the band. The song “Seasons of Change” was recorded using a couple of musicians from the band Fraternity, Bon Scott and keyboardist John Bissett. Bon had sung some backing vocals and had played recorder on the track. He loved the song and asked could he record it with Fraternity. A deal was eventually struck that allowed Fraternity to record it and release it as a single on the understanding that Blackfeather would not release their version in competition. Unfortunately, against the bands wishes, the record company reneged on the deal as soon as they saw how popular the song was. This caused a major rift between the band and the record company which eventually led to more lineup changes. Well, well. The things that can be dragged up out of the past from a Saturday morning listen to the Coodabeens!